CAE is a leading global training company in the civil aviation, defence and security, and healthcare markets. With seven decades’ long experience, CAE has made flying safer, maintained defence force readiness and enhanced patient safety with its trainings and expanded product offering. The company has a global presence with 160 sites and training locations in over 35 countries. By geography, USA accounts for 36% of revenues, followed by Europe (28%) and rest of the world including Asia (36%). CAE offers a comprehensive portfolio of training service, and simulation products for the air, land, naval and public safety markets. It operates through Civil Aviation training solutions (56% of revenues), Defence and security (40%), and healthcare segments (4%). CAE is the training partner of choice for aviation professionals, business aviation operators and aircraft manufacturers over the world. The company has the largest civil aviation training network in the world and is the leader in aviation personnel recruitment. CAE has trained more than 220,000 civil and defence crew members, including more than 135,000 pilots, and thousands of healthcare professionals worldwide. The company operates in highly regulated industries with compulsory training requirements. This results in recurring business and sticky customer relationships. CAE generally enters into long term agreements with business aviation customers worldwide such as AirAsia, Jazz Aviation, Flexjet etc. A large network of global training centres, unique training solutions, and a wide product offering are CAE’s key competitive strengths. Civil aviation segment should benefit from secular growth trends in commercial and business aviation. CAE currently commands a 35% share of the civil training market and 70% market share in simulators worldwide. There is growing demand for new civil and business jet pilots, and captain upgrades. 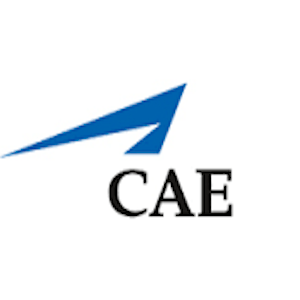 CAE is looking at acquiring Bombardier’s Business Aircraft Training business to expand its position in the business aviation training market. The company is expecting operating income growth in all segments in 2019, driven by its training solutions, new customer partnerships and launch of innovative products. CAE’s defence and security business is present in key growth markets and should benefit from increased government spending in this sector. CAE’s defence business has a huge headroom to grow in the $17 billion training systems integration market. Defence organizations worldwide trust CAE for its innovative and comprehensive training solutions. As a leading provider of a broad range of training solutions in healthcare, CAE’s healthcare segment should also benefit from increasing use of simulation, growing emphasis on quality care and patient safety, and technology revolution in the medical industry. CAE is a Canadian Dividend Aristocrat with a current annual yield of 1.4% and a reasonable payout ratio of 30%. The company last raised its dividend by 11% and has an impressive dividend growth of 22% CAGR over the last decade. The company also has a share buyback plan. CAE Inc. enjoys a reputation of a trusted partner for regulatory organizations and the industry associations like IATA, Federal Aviation, EASA etc. The company constantly engages in the development of advanced training solutions for its partners. A strong client list grants visibility of cash flows. Moreover, CAE’s increased focus towards services also increases its share of recurring revenues. The company has been looking at increasing its revenues from services, which now accounts for 60% of total revenues as compared to just 15% in 2001. The company also has a strong order backlog, growing at 16% CAGR in the last five years, which further increases visibility. Capital deployed in Civil in the last five years has been accretive. The acquisition of Bombardier’s Business Aircraft Training will also be accretive to earnings and generate free cash flow in the first full year of ownership. CAE is well positioned to use its strong financial position to pursue growth opportunities. Unique comprehensive solutions, unmatched global reach and scale and deep customer relationships form a deep moat around CAE’s business. The commercial airline training industry is quite competitive. CAE’s major competitors are aircraft manufacturers and companies having deep industry relationships. Many aerospace and defence companies are capturing market share by consolidating existing commercial aircraft simulation companies and by developing their own internal capabilities. Rockwell Collins, Lockheed Martin NYSE:LMT, Boeing, RaytheonNYSE:RTN, etc. are top competitors. Many new participants have also emerged in recent years. As a pure-play training company, CAE differentiates itself from competition with its innovative training solutions such as the next-generation pilot training solution CAE Rise and proven leadership in training equipment and services. CAE Inc. is a leading provider of training solutions to the civil aviation and defence industries as well as the healthcare simulation market. The company is well positioned to capture market share in a growing civil aviation and defence market. It has diversified set of different businesses with a high degree of recurring revenues. Given its reputation as a worldwide leader, CAE continues to deliver comprehensive defence training programs around the globe and should continue growing dividends in the high single to low double digit range. The business cycles and need for continuous training should prove beneficial for investors. With CAE’s diversification approach should help balance any lull in a specific industry.